We are in a liminal moment for global health financing. The “golden age” of increasing donor funding is clearly over, arrested by the 2008 financial crisis. But while donor contributions are no longer climbing, they have not been falling, either. And it is possible this status quo will hold… But it’s equally possible that this is just the pause before the roller-coaster drops. Considering that Gavi, the Global Fund, and the World Bank will all be launching another replenishment round in 2019—and given the uncertainty surrounding US foreign aid commitments and post-polio financing—that drop may prove very steep indeed. From the start, Global Fund and Gavi support was designed to be catalytic and temporary—something that countries would wean off of as GNIs [gross national incomes] and self-financing capacity increased. However, as a growing number of countries become ineligible, observers have raised concerns about the pace of change and whether governments have allocated sufficient resources and mustered the political will to maintain programs post-transition. 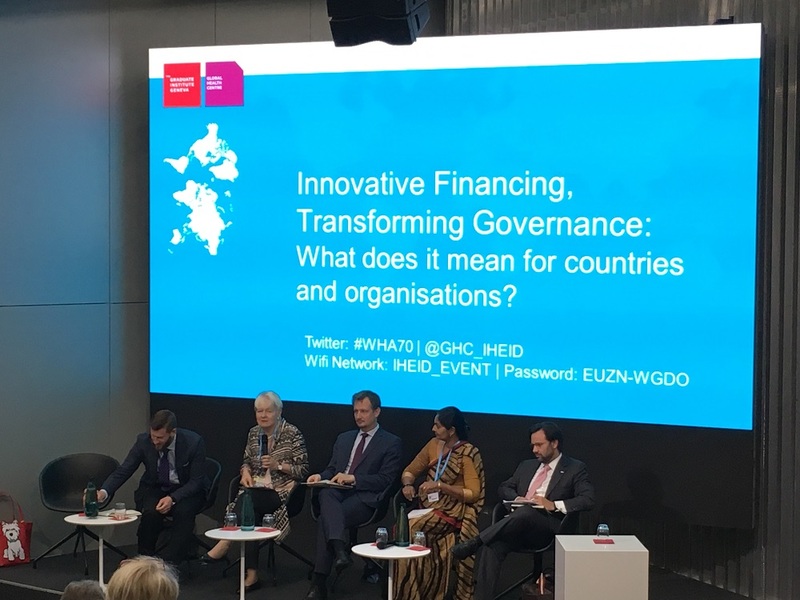 Both organizations acknowledged the complexities and challenges of transition, especially for countries that face a loss of funding from multiple bilateral and multilateral donors at the same time. Yet the speakers also implied that the level of anxiety about transitions is disproportionate to the magnitude of their impact. According to Feldbaum, the Global Fund currently has only 12 “components” (receiving $35 million total) in transition. In contrast, 92% of Global Fund grants (about $9.4 billion) goes to low-income countries, which are “not even close” to transition. Gavi projects that 19 countries will exceed the eligibility threshold in the 2016-2020 period. But Cornejo explains that since 2008, Gavi has implemented a mandatory self-financing model, in which all countries contribute at least a small amount to the cost of their programs. As GNI rises, countries’ co-financing requirement gradually increases; by the time Gavi financing ends, they are already self-financing most of their programs. On this, the panelists were emphatically unanimous. In what Tim Evans calls a “big awakening”, donors have come to realize that “there isn’t anything that development assistance [for health (DAH)] alone can do”. The essential strategic question for the Bank isn’t how to get more donor funding, it’s “how do we use DAH to support the mobilization of domestic resources.” Evans points out that DAH only accounts for a small percentage of the total amount of money spent on health in developing countries. The majority of that money comes from private, pay-as-you-go financing, which is “the worst” approach. Going forward, donors’ most valuable contributions will be in the form of technical assistance and capacity building (e.g. assisting governments in strengthening national financing plans or bolstering pooled procurement mechanisms so that national funds can be used more efficiently). By way of example, Hendrik Schmitz Guinote described Germany’s bilateral and multilateral efforts to help countries develop national health strategies. Sri Lanka exemplifies both the progressive changes and the challenges that panelists expect to see. Susie Perera reported that external donor support accounts for only 5% of the country’s total health expenditures. In the past, Sri Lanka received support from Gavi and from the Global Fund for all three diseases. Now, immunization programs are fully financed by the government (with the exception of a “small amount” of support from UNICEF); HIV and TB spending are still supported by the Global Fund, but malaria has been eliminated. But Sri Lanka is also facing a new set of challenges. Despite a general tax-based financing system and the government’s commitment to provide free care at point of delivery, out-of-pocket expenditures still account for 42% of all health spending. The country currently spends about 1.5% of GDP on health, but is now having trouble stretching that to address non-communicable diseases. The Ministry plans to free up additional funds by curtailing investments in infrastructure and reorganizing primary health care services, but whether this will be enough is an open question. For Perera, Sri Lanka’s experience demonstrates the importance of strengthening national health systems, not only in terms of healthcare delivery but also in terms of management and organization. Evans argued that financing also needs to become more systematic. Disease-specific approaches, whether in the form of donor programs or sin taxes, are outdated. And according to Guinote, donors also want to see a more coordinated approach at the international level to prevent fragmentation, duplication, and overburdened aid budgets. In other words, try to avoid having the Global Fund, Gavi, and World Bank replenishments all in the same year.